Micro Moths b Macro Moths 1 Macro Moths 2 Macro Moths 3 Macro Moths 4 Macro Moths 5 Macro Moths 6	Beetles Page 1 Beetles Page 2 - Weevils - Ladybirds Bugs Dragonflies, etc. Flies Page 1 Flies Page 2 Flies Page 3 Hoverflies Sawflies Bees and Wasps Other Insects Spiders Galls page 1 Galls page 2 Plants Animals Birds page 1 Birds page 2 Leeches - etc. What is it? Many of the field guides fail to adequately cover the large number of small moths which fall into the 'Micro Moth' category. To be fair, many 'micros' can look confusingly similar and it is only the more distinctly marked species that I have found and been able to put names to, that are illustrated here. This is quite a small moth, but with its characteristic way of always spread-eagling its wings and its pure white colouring, it really is quite spectacular. It has an overall wingspan of 25 to 30mm with a body length of about 10mm. I had read that there were four 'feathers' per wing. But, having taken the lower image it is evident that those who christened the species, knew what they were talking about. It is possible to make out five feathers per wing, hence 'penta' (five) 'dactyl' (fingered). 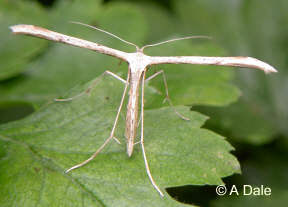 The leg spurs which are so prominent are a common feature in many other moths. It is normally found around hedgerows since its larval food plant is convolvulus, or bindweed. This should make it a friend of the gardener. Unfortunately, the bindweed tends to grow rather faster than the caterpillars. 21.06.2003 Hay Meadow, western hedge. 26.06.2005 First of the year, East paddock hedge. 25.06.2006 First of the year, East paddock hedge. 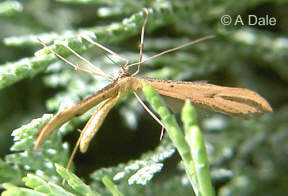 The Plume moths are strictly classified as 'micro moths'. Confusingly, some micro moths can be larger than some macro moths. The Common Plume is found close to its food plant convolvulus or 'Bindweed' throughout temperate Europe and the UK. As the two images illustrate, both colouration and wing presentation can vary considerably, the latter depending on how tightly the wing is 'rolled' at rest. Prime identification features are the central dark spot and the 'swept back' tip of the wing. 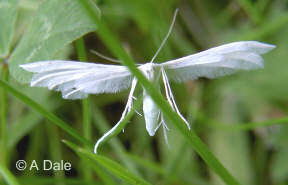 It is slightly smaller than the White Plume, which it is often seen with, flies from June onwards and hibernates as an adult moth through the winter. 02.07.2004 Home paddock by roadside hedge. 28.09.2005 Disturbed from a cupressus hedge having Convolvulus growing through it..
15.10.2005 Disturbed from a hawthorn hedge having Convolvulus growing through it..
25.06.2006 First of the year, back garden lawn. 07.03.2007 First of the year, showing signs of wear and tear, front garden hedge. 05.03.2014 First of the year, day flying. 20.08. - 30.10.2014 Common visitor, day and night flying. 'First thing to point out about this small unusual moth is that the Common Name is not truly correct. Each wing does in fact have 6 plumes making 24 in all. Thankfully the Scientific name ('hexa' = 6, 'dactyla' = fingered) is accurate. This may be difficult to verify in real life - and also in the upper image but, the lower image taken with back lighting verifies the six plumes per wing more clearly. This is a very small moth, it's wingspan being no more than 16mm. And despite it being classified as common, widespread throughout the UK and to be found flying in most months of the year, I had never seen one until my March 2011 sighting - and then it turned up on the inside of my garage window. 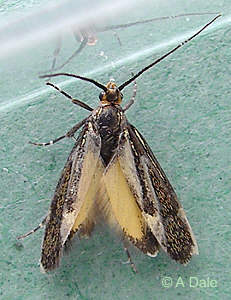 It is the only member of the Alucitidae family of moths that is resident within the uk although there are in excess of 100 other relatives to be found in continental Europe. The species is reputed to have two generations per year which could account for the adults being found all year round. 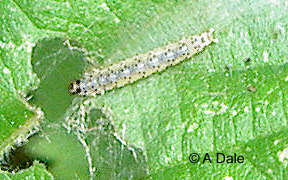 But the larvae are small creamy white caterpillars that feed on the leaves and within the flower buds of Honeysuckle and they are not often seen. 23.03.2011 Found on an indoor window. 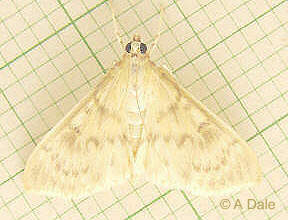 The Mother of Pearl is the largest of the micro moths with a wingspan of 40mm. That makes it bigger than many of the macro moths. But, nature does not always lend itself to having everything neatly pigeon holed according to mankind's convention. It gets its name from the lustrous sheen of its wings in certain lighting conditions. Although it is reputed to be a dusk flyer, the upper image was taken at 16.30hrs in mid-summer. Seen here resting on Cleavers, Gallium aparine, the hedge contained its full quota of nettles, Urtica dioica, the larval foodplant from September through to June. 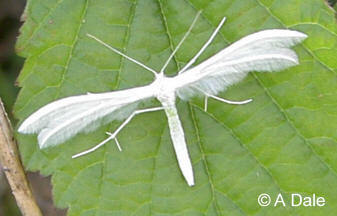 The lower image of the pale form (smaller, with a wingspan about 32mm) was attracted to light after dark. The larvae winter hibernate in cocoons at ground level. 21.07.2004 HayMeadow, western hedge, about 16.30hrs. 30.07.2005 Two disturbed from stable paddock hawthorn hedge at 17.00hrs. 30.07.2006 Note the date! The pale form flew indoors, attracted to light. 12.07. - 13.08.2014 Attracted to light. This is a tiny little moth, a micro moth in every sense. Very restless and easily mistaken for a small fly. It is for all the world like a little piece of horseshoe confetti. The pale fringe on the outer edge of the wings is not always as prominent as is seen in the upper image - indeed within any given community there can be quite a variation of colour and markings. It is often overlooked, but many can usually be found flying around clumps of the stinging nettle (Urtica dioica) which is the food plant of the larvae. That said, despite nettles being in abundance each year, the moth disappeared from my location for 3 years before re-appearing in 2012. The larvae are small creamy translucent caterpillars with many tiny brown spots all over the body. The larvae usually spin a web on the upper surface of the nettle leaf which draws the leaf into a folded shelter. The moth flies from May onwards throughout the summer, probably in two generations. 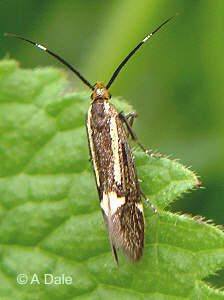 It is about 10mm long with a wingspan of 10 to 15mm. 05.06.2003 Hay Meadow, western hedge. 13.05.2004 First of the year - on nettles underneath Chestnut tree. 10.08.2004 Larva found spinning silk on the surface of a nettle leaf. 20.05.2005 Sudden emergence of dozens flying through the Hay Meadow western hedge. 18.05.2008 Overwintered pupa emerged. Looking small and dark but, nicely marked. 04.06.2009 First (and only!) adult of the year seen on nettles at base of Hawthorn hedge. 20.06.2012 Moth seen again on nettles at base of Hawthorn hedge. 12.05. - 12.06.2014 Common day flying moth. Although I had never seen it prior to 2005, this little moth (no more than 10mm long) is rated as 'not uncommon' and appears to be becoming more numerous. The species name, 'sulphurella', derives from the bright yellow underwings which are briefly visible in flight but normally hidden at rest. The second image was taken just as the moth landed from flight and before the wings were tightly folded into the rest position. This second image is of a one day old specimen. When it emerged from pupation it was much paler and lacked the strong contrasting markings. During its first 24 hours the wing colouring darkened markedly but, even then, the stark contrast of its mature markings had yet to become established and the antennae marking is only barely visible. In the mature moth the antennae are contrastingly marked and always held forward in a conspicuous manner and give a good clue to identification. The moth normally flies in May and June although, after a mild winter, one was observed to hatch in mid-April 2007, having fed on and pupated in soft well rotted wood. The 15mm caterpillar shown here was found in December on a well rotted branch of Elder, Sambucus nigra, within 25m of where the adult moths were found. In extremely cold conditions the larva would enter a dormant stage before a rise in temperature would stimulate it to feed again prior to pupation in March / April. 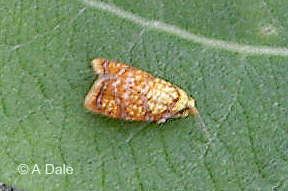 20.05.2005 Found on nettles, western hedge of Hay meadow. 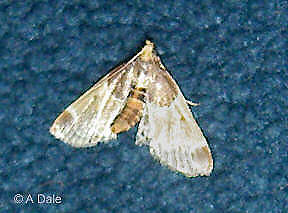 24.05.2005 Found on nettles and broad leaved grass opposite front door. 06.12.2006 Larva found on well rotted Elder branch lying in lank grass. 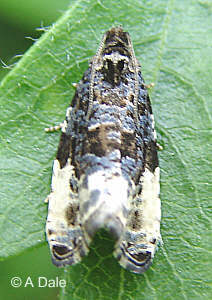 16.04.2007 Pale newly hatched moth emerged from pupation in rotted timber. 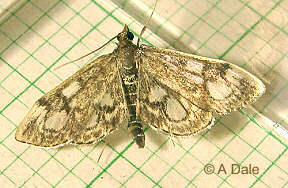 10.04.2009 Moth, wing with white diamond but lacking the forewing white stripes and antennae markings, found on indoors window. 30.05.2012 Day flying found on hedge bottom vegetation. 03.05. - 16.05.2014 Attracted to light at night. 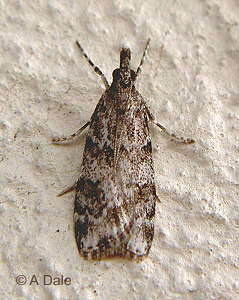 This is a member of the Pyralidae family of micro-moths, a large grouping of somewhat dis-similar species. That said, the Scoparia species fortunately do tend to resemble each other which helps greatly in narrowing down the identification options. The appropriately, if somewhat unimaginatively named, 'Brown Grey' is relatively common in the UK. The lowland race tends to frequent trees and wooded areas in the south and flies from May to July. This one measured about 12mm overall length. The upland race, smaller and darker, favours moors and heaths in the north and west and flies from July to August. 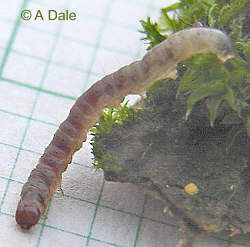 The larvae feed at ground level on moss and plant roots. 06.07.2005 Resting up all day on garage wall under a chestnut tree. 01.06. - 27.07.2014 Attracted to light. From June to September, this species can be found throughout most of the UK. 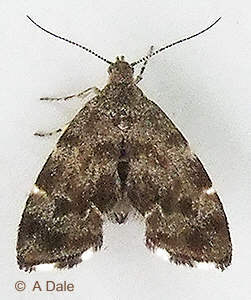 Positive identification can be difficult due to there being several similar looking species (the pevious species Scoparia ambigualis, being an example). Noting differences in the species can be obvious when the specimens are side by side, but when found in isolation can be very tricky. The larval foodplants are mosses, typically Hypnum. 18.06. - 30.07.2014 Attracted to light. It may be small, the forewing measures no more than 10mm, and there are paler colour forms but, the shape, gently hooked wing tips and the net-like pattern on the wings are all strong clues to this moth's identity. 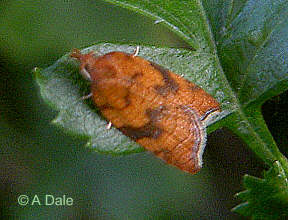 This is an autumn species, the adult flying from August to October and often found around trees, hedges and shrubs. It is generally nocturnal, the image having been taken at 20.30hrs. The larvae, which overwinter, can be found on early foliage buds of hawthorn, blackthorn, apple, rose, etc. from April before graduating to choice leaf tips and flowers as they appear. 22.08.2004 Hay Meadow southern hedge on hawthorn. 09.09. - 16.10.2014 Attracted to light. This is a tiny little micro-moth, only 8mm long with wings folded and with a 15mm wingspan, but this specimen, with it's eyecatching coloration was quickly spotted. As with many moth species there can be some variation in colouring and there is a tendency for paler forms to predominate. It was found in afternoon sunshine in lawn grass under an overhanging rosebush. 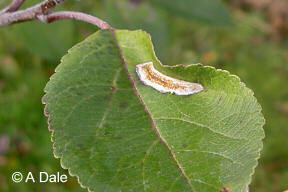 The larvae, along with some sawfly larvae, share some responsibility for 'leaf roll' damage to rose bushes. This obviously reduces the area of leaf exposed to sunlight and reduces the vigour of the plant to a greater degree than would be caused by the amount of leaf actually eaten. The larva also pupates within the leaf roll and is therefore rarely seen unless specifically looked for. 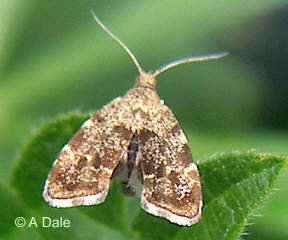 The moths hatch and are on the wing during June and July. Eggs are laid on the stem of the plant and remain there throughout the winter, to hatch in Spring. 22.06.2005 Found on lawn grass under overhanging garden rose bush. First, a warning. 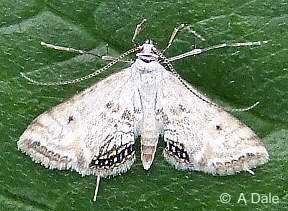 Care needs to be taken over confusing this species with the Marbled Orchard moth, Hedya nubiferana. The differences are quite subtle. This is a species whose colouring makes very effective camouflage against a background of dappled foliage. The image on the right was taken against a blackthorn hedge and, when seen in isolation, it seems strange that I must have overlooked it several times before I spotted it. The adults fly from May to July and although regarded as 'fairly common' are probably under-recorded. 16.06.2006 Found on a Blackthorn (Sloe) roadside hedge. 30.05. - 01.07.2014 Attracted to light. When this Garden Pebble flew indoors, attracted to light, it appeared almost white in flight due to its very pale underwings. Although at rest this one was an attractive golden brown, they can be found in both pale and dark forms. And their resting position can either be with wings spread out, as here, or with wings folded tightly, tent like. Overall length is about 10 - 12mm. It is a double brooded species, flying in May/June and again in August/September. The larvae favour plants in the Cruciferae (cabbage) family and can prove to be a nuisance to gardeners. 04.06.2014 1st generation attracted to light. 24.08.2014 2nd generatiion attracted to light. A fairly common species throughout the UK, to be found in the vicinity of Elder trees during the months of June and July. 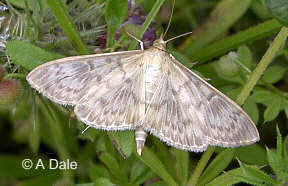 It has distinctive wing patterning although coloration can vary with light and dark forms and 'old' moths tend to look paler as they lose wing scales through normal wear and tear. Body length about 11mm, wing spread about 25mm. The larvae feed on the young tender leaf shoots of Elder, Sambucus nigra, and after leaf fall will hibernate till spring. 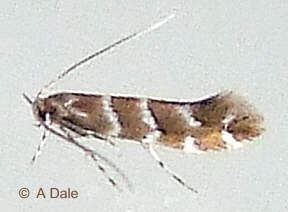 This little micro-moth, with a forewing of only about 10mm, has more than a passing similarity to the Fan-foot macro moths. 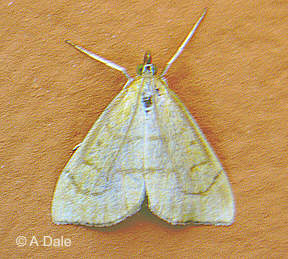 See the Fan-foot image on Macro Moths page 1. In particular it is often confused with the paler coloured 'Clay Fan-foot'. The main distinguishing feature is that this micro does not have the straight line across the trailing edge of the wings. Instead, it has a dark line running down the front part of the forewing. The two apparent lines flowing back from the head creating an inner 'A' shape are, in fact, its antennae. 22.07.2005 Day flying. Flew indoors. This is a single generation species that flies between June and August. The image on the right is of a male as indicated by the largely white forewings (about 10mm long). 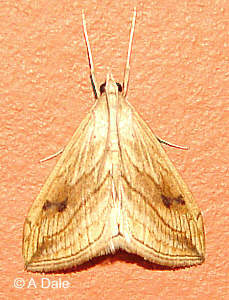 The larger female's forewings (about 12mm long) tend to be creamy fawn in colour. But both have the same light hind wings, the outer fringe of which is decorated with a distinctive chain of blue-black dots. The males are mainly found near still water colonised by duckweed. The females, however, tend to be more adventurous and are often attracted to light as they seek out new duckweed breeding areas. The dark grey larvae live an aquatic existence feeding exclusively on floating duckweed and shelter under the water surface in little tubular cases (similar to caddisflies) constructed from fragments of the food plant. The case encloses a bubble of air that allows the caterpillar (like all caterpillars) to absorb air through a row of 'spiracles' down each side of it's body while allowing the head to browse underwater. Pupation takes place in a silken cocoon within the air bubble. In early summer, as waterlevels tend to subside, the pupa stands a good chance of being stranded above the water margin and will allow the adult to emerge without getting its feet wet, although, breaking out onto a floating bed of duckweed would not be disastrous. 23.07.2009 Found at rest on foliage overhanging small garden pond - containing duckweed. The Meal moth shown here is something of an enigma. It's normal flight period is during July and August - and this one was found in mid December. Which probably accounts for its pale faded colouring. In their prime they are very attractively marked. 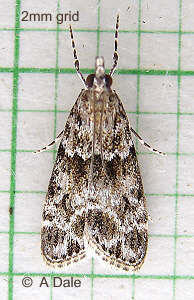 The fore wing length is about 12mm. As seen here, the normal resting position is characterised by the rear abdomen being held in an exagerated raised fashion. Although it is to be found throughout the UK it is only found very close to its food sources, i.e. grain stores and granaries where its larvae can be severe pests. 18.12.2003 Found in a shed containing bird feed seed and grain. My first thought was that this might be a gall, but I have had it suggested that this has the hallmarks of one of the Phyllonorycter moth larva leaf-mines, either P. leucographella or perhaps more likely P. corylifoliella, since it seems to show some brown flecking. These are the two which create these upperside leaf blisters, and both occur on apple (as seen here) as well as other foodplants such as Hawthorn. 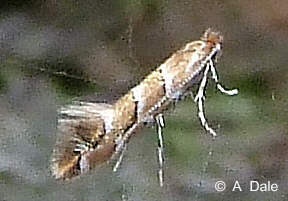 The image at http://www.leafmines.co.uk/html/Lepidoptera/P.corylifoliella1.htm does look similar. 04.11.2003 Back garden, Apple tree. This is a relatively new species to the Uk, having originated in central Europe and being first seen here in 2002. It's colonisation of England and Wales has been little short of amazing and it is said that virtually every Horse Chestnut tree in Lincolnshire has been affected by it. The upper image is of a Horse Chestnut leaf (a small leaf from a young sapling!) that has been extensively 'mined' by the larva of a Horse Chestnut Leaf-miner moth. On hatching from its egg, the larva will burrow through the upper surface of the leaf and will then spend it's entire larval existence eating the soft plant material that lies between the upper and lower surfaces of the leaf. This gives rise to the transparent tunnels as seen on the left side of the leaf. 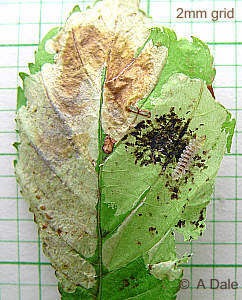 On the right side of the leaf a portion of the papery upper surface was removed to expose the tiny 4mm larva and the dark area of 'frass', the residue of digested plant material passed by the larva. Some mined leaves can be so transparent that if held up to the light it is sometimes possible to see the active larva within. But, with up to three generations a year of this species, it is often the case that the original larva may have already vacated the mine. 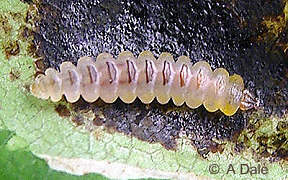 The second image is a close-up of the larva showing it's quite distinctive shape. At only 4mm long, a magnifying glass or low powered microscope is really needed to appreciate it to the full. 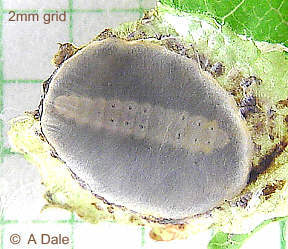 The third image is an external view of the fine papery pupal chamber that the larva constructs prior to entering pupation. Because the larva is constrained within the walls of the mine it does not need well developed legs to move around and its vestigal spur-like legs can be seen in this underside view. 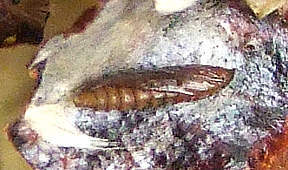 The fourth image is of the pupa. Again, at only 4mm, it is tiny and would escape notice unless specifically searched for. It is a source of wonder that something so small and fragile could escape the dangers of autumn leaf fall, the rain, wind and icy conditions of winter and the decomposition of piles of leaf litter to emerge as a moth in springtime as the first of three prolific generations. Having never seen the moth, despite its numbers, I gathered up some fallen leaves in the autumn, managed to find four or five pupae and kept them under observation through the winter. I was rewarded when the first moth emerged at the end of April. This coincided with new leaf growth on the tree. At only 6mm long the moths are tiny and it is hardly surprising that they go un-noticed. And of course, as with many things, once one knows what to look for, the tiny moths are relatively easy to find at rest on the bark of the Chestnut tree trunk. 30.04.2010 First moth hatched from autumn gathered pupa. 17.05.2012 First adult seen in 2012. 22.04. - 14.05.2014 Big emergence of 1st generation day flying.